This is Australia mate. What is wrong with calling it 'might be a Grade 22+ offwidth...' ? From (old and fading) memory, I think it has been done, though the details are tending to escape me, I think it required some aid to top-out?? It's an amazing looking line and doesn't appear in either of the guidebooks I have, which suggests to me it may be an exception to your otherwise valid generalisation. Just because it's not in the guide doesn't mean it hasn't been done. It just means the person who did it was too lazy/ethical/foreign to write it up! There's a capping overlap of some kind at the top, isn't there? Just Go climb it and post ya pictures here! It stops at a big roof. I think you can squeeze through to the top of the buttress from there. I believe Mikl did the traverse left along the horizontal under the roof from the finish of Caligula back in the mid-70s. Well I'm satisfied it hasn't been climbed. I'll stick some bolts in it next weekend and let you all know how it goes. >Hmm, I remembered it being longer..
U will get a better xperience on Monarch. 1ce U do that, M9 might be right about aid rqd 4 tha escape left or right, though it pains me to say it. 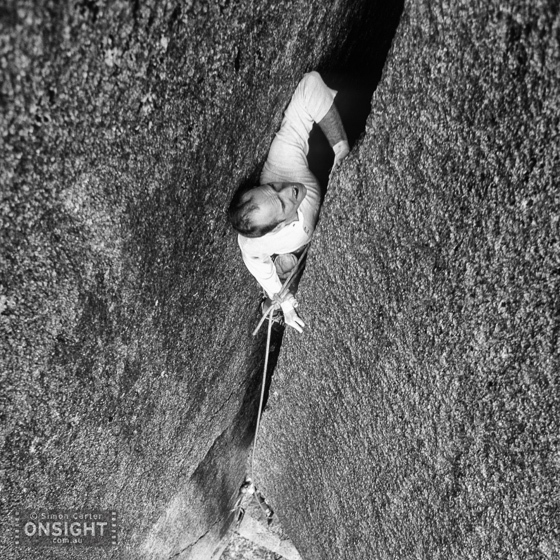 Looks more like a squeeze than an offwidth. None-the-less, I have a blue big bro you can borrow. >next weekend and let you all know how it goes. That would generally be frowned upon by a lot of the climbing community. There's a 14 page thread on here about bolts at the horn for example. I struggle to imagine it hasn't been done given the style, what has been done and where it is. But the only thing left of Caligula I can find that might remotely be it is Monarch Variant Start which says the obvious off width left of Caligula to tope of flake and L to Monarch, although there is no way that route would go into Monarch! That doesn't necessarily mean much with the old Buff guide though. My other thought is that is a long way off 24. Have you done Monarch? I tried to find a picture of the grade 17 second pitch, but to no avail. It makes that route look, well, 17. Mark Davies sans pro high on pitch two Monarch (22), 75-metres. 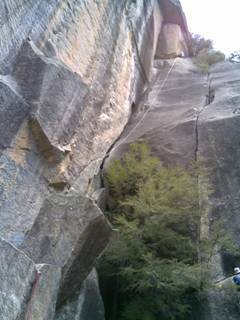 The Gorge, Mt Buffalo. There are 55 messages in this topic.